Am back with yet another delicious snack made with jackfruit- Chakka Ela Ada. It is made on the similar lines of ela ada except that it has chakka varetti added to it. If you have a batch of your chakka varetti still left,then go ahead and try this yummy chakka ada. My kids don't like the jackfruit just like that and they eat just one or two. I find this is a good way to sneak in jackfruit to them and above all its a healthy guilt free snack. 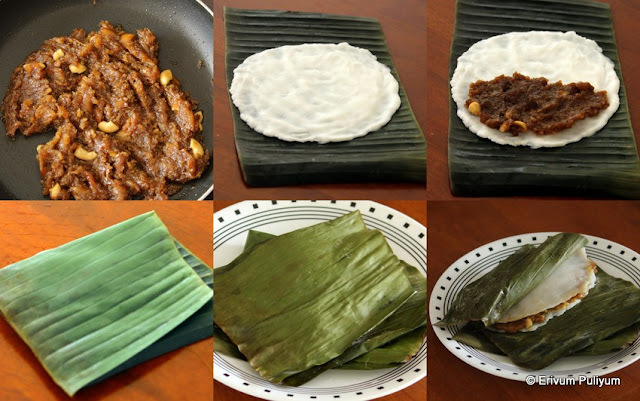 These are steamed in banana leaves that imparts a flavor in itself just like the chakka kumbilappam that I posted few days back.Have I started boring you guys with chakka recipes?? If no, then will continue with few more of my favorites with jackfruit. If you are interested in trying out more steamed, guilt free snacks then do check the end of this page and you can see many sweet delicacies steamed,oil free ones that can be tried for after school snacks. In another pan, heat the ghee. When it is hot,add the cashews and fry lightly. To this add, chakka varetti, strained jaggery water, grated coconut, ground dry ginger, cardamom powder and cumin powder. Mix it well and wait till the moisture is dried up. Switch off flame and leave to cool. Divide the filling in six equal portions and leave covered. In a sauce pan, boil water for making the dough like we do for idiyappam (string hoppers). in the mean time,add the flour in another bowl with salt. Add the boiled water to the flour and make a dough just like for idiyappam. Dip your hands in ice cold water and knead the dough when it is still hot so that the dough is soft.Make six equal portions of the dough, keep covered till further use. Cut out banana leaves by removing the middle rib and cut in small rectangular pieces. If using frozen leaves, then thaw and cut pieces.Wash under running water and keep aside. Keep a bowl of water ready to dip your hands in water and spread the dough. Now, take a banana leaf and place a portion of the dough. Start spreading the dough using your hands, when the dough becomes sticky ,dip your fingers in water and spreed evenly and thin as possible in a round or rectangle or oval shape. Spread a layer of the divided portion of the filling on one half of the side. Cover the other side of the banana leaf on top of the filling so as to snuggly cover the filling and fits correctly on the base dough. Repeat the same step to make the other portions of the dough in the similar way. Place an idli steamer with enough water. Transfer the prepared ela ada to the steamer. Once done, remove the adas using a spatula. Place on a plate, leave to cool for 5 mins and then serve. Enjoy delicious adas ! * If you are using homemade rice flour,then check out here. Such a tasty combo, you made it perfectly..